Gas stove grate with 1 quart paint can with 16 vents holes in bottom, hence sweet 16, filled with wood pellets. 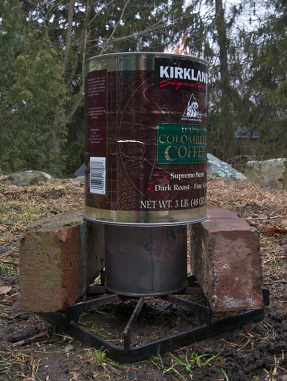 Secondary air and 'chimney is a CosCo 3 lbs coffee can with the bottom removed - no other alterations. Bricks raise chimney up close to the top of the fuel can to give better draft. 1 quart of fuel burned for about 55 minutes. 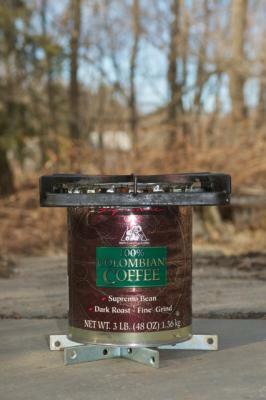 Poured the biochar into a quenching can made from a 1 gallon paint can. The Sweet 16 appears to burn longer than my first experiment with two 1 quart cans stacked one on top the other. Perhaps a gain of as much as 10% in burn time. 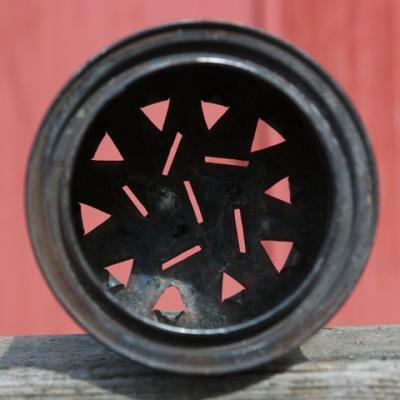 A second gas stove grate. Made myself a nice cup of tea. Note: The Sweet 16 only requires a can opener to remove the bottom of the coffee can and a punch through can opener to make the 16 vents in the bottom of the one quart can. I marked the rim of the 1 quart can every 2 and 5/8's inches around the circumference. This yields 5 quite evenly spaced marks. Connect them across the bottom with a straight edge and a marker to get a 5 pointed star. The star makes it easy to place 16 vent holes -- 10 around the outer edge, one in the very center for the "Up Draft". This is the original burn pot updraft intake design for a one quart can used in the Sweet 16 TLUD. Measure around the can with a cloth tape. Divide by 5. Mark this length off around the can. Connect the dots across the can bottom to get a 5 pointed star. Use this as a guide for your can opener work. 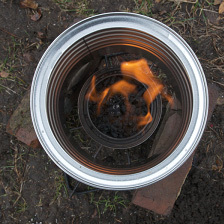 The simplicity, and the fact that no tin snips are required, no jagged edges, make this a very safe stove for young students to make. It will burn for about an hour. If you have two 1 quart burn pots, you can burn forever. A meal requiring two hours of cooking would be very simple to accomplish. Upon reflection, what we have in the Sweet 16 TLUD is variable temperature cooking. As the out side can can be raised and lowered, the effect is to be able to control, somewhat, the desired cooking temperature. I will add a ring of holes around the top to make sure that the cooking pot on top of the outer can does not choke the fire. You will see that Nat does this with the Lucia stoves he is making in Haiti. I am now using three good sized angle irons as the grate at the base of the Sweet 16. Cheaper and simpler. Lastly, the 1.5 inch diameter grass tablets burned spectacularly in the 1 gallon burn pot. At the end of the burn, about 50 minutes, there was a pure blue flame from the charcoal and the can was glowing cherry red in places. I note that grass tablets RELAX & EXPAND when they are pyrolysized. Thus it is important to only fill the burn pot about 60% and to make sure the tablets are only loosely loaded. If the tablets are too tightly loaded, when they expand they will choke off the up draft. 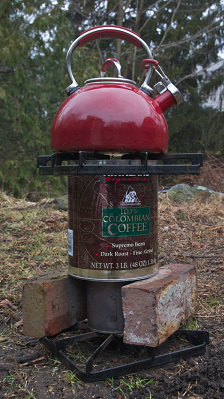 Cosco coffee can. Ten holes would be enough and leave better structural integrity. Three angle irons used as bottom grate for updraft intake. Very stable. This is a very low power TLUD. Perhaps 10,000 BTUs per hour plus some biochar. Burn time with wood pellets is about 50 minutes. Great for demos, educational use, and introduction to the making of biochar.